Pure Organic bars have been around for years. So when I saw that they had some new products out at the food show, I was super excited. 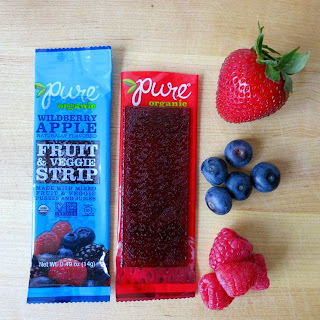 Pure is one of those great companies that uses all organic whole ingredients in products that are gluten-free, vegan, kosher, certified organic, and Non-GMO Project Verified. My favorite of their new products was the Fruit Sandwich. 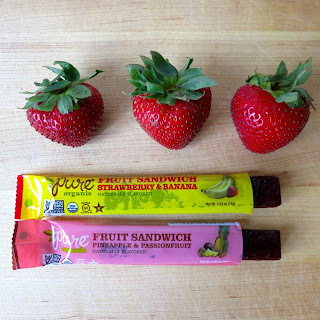 It's like two different flavors of fruit leathers served as one -- a fruit sandwich! I loved both of the ones I tried and thought they were a great healthy snack. The flavors they sent were Strawberry & Banana, which had one thick layer of banana sandwiched in between two thin layers of strawberry; and Pineapple & Passionfruit. The ingredients really are pure. Take the Strawberry & Banana for example. The ingredients are apple puree concentrate, apple juice concentrate, banana puree, natural flavor, strawberry juice concentrate, vegetable juice, turmeric for color, citrus pectin, lemon juice concentrate, citric acid, and ascorbic acid. They were super sweet and would make a great dessert after your worktime lunch. Next, I tried their new Fruit & Veggie Strips. Both strips that I tried, Strawberry Apple and Wildberry Apple, were much thicker than your average fruit leather and much more natural. I only wished they were bigger. Lastly, I tried their new Ancient Grain bars. 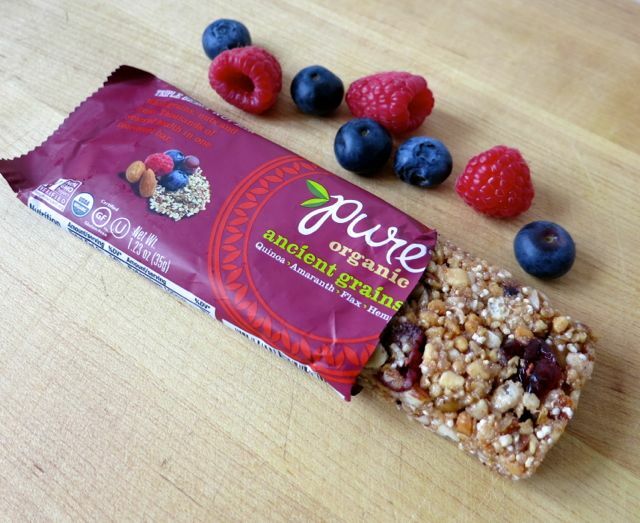 I love that these bars are made with whole grains like quinoa, amaranth, flax seed, and hemp seed, nuts, and brown rice protein. But, I found them to be very dry. 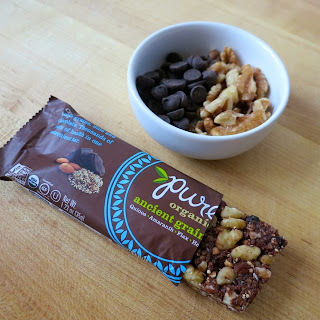 The Chocolate Chunk Nut bar had a nice flavor with huge chunks of walnuts, almonds, and chocolate chips, but was super dry. And I wasn't a big fan of the Triple Berry Nut Bar at all. I did like that they were only 160 calories and 9-10 grams of healthy fat though considering they are a good sized snack bar. 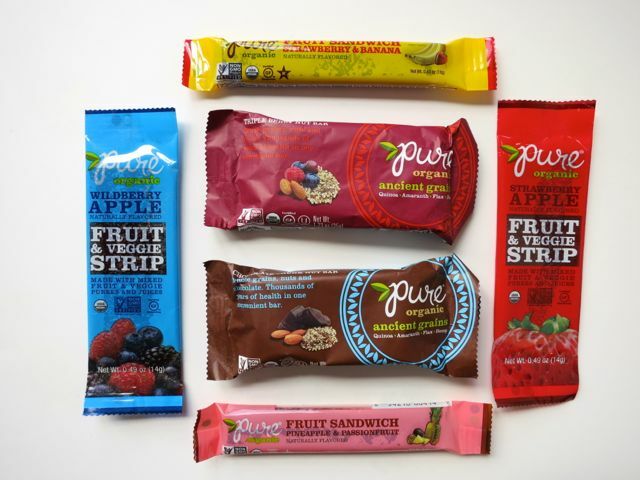 In sum, in general I'm a big fan of Pure products healthy organic snacks. 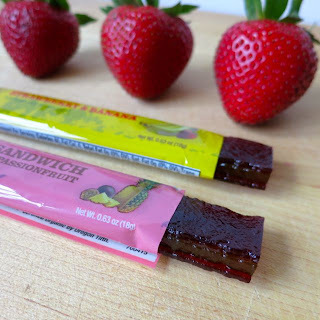 I especially like their fruit sandwiches, which are a creative spin on fruit leathers and their fruit & veggie strips. To try them for yourself, click here.